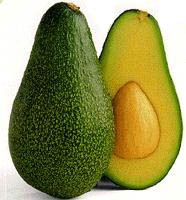 An avocado is a type of fruit that is yellowish-green and mushy inside. Avocados grow in South Africa. This page was last edited on 9 February 2018, at 22:10.